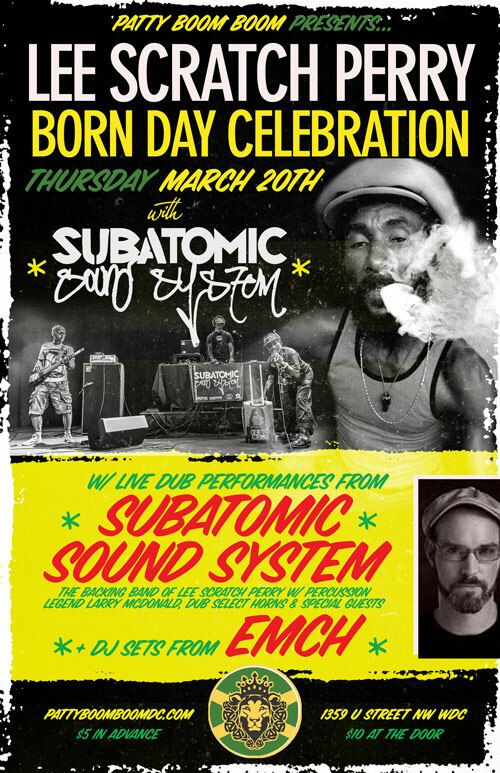 This Thursday March 20, Subatomic Sound System will be in Patty Boom Boom on U street in Washington DC performing live with Emch on the dub mix, the legendary Larry McDonald on percussion, Troy Mobius’s Dub Select Horns with special guests, and DJ sets by Emch all night for a special Lee Scratch Perry Birthday party event celebrating the music and legacy of one of Jamaica’s (and the world’s) most influential music creators. Link up on Facebook. Check some videos of Subatomic Sound System & Lee Scratch Perry performing at Coachella during our 2013 tour.